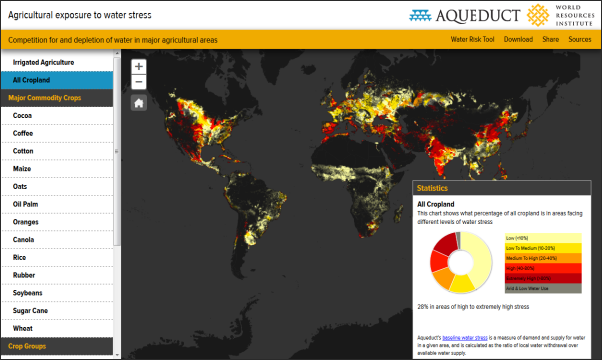 Blue Raster recently worked with the World Resources Institute (WRI) to build the Agricultural Exposure to Water Stress interactive map which highlights the intersection between 20 commodity crops, from coffee to cocoa to oranges, with different levels of baseline water stress. The new series of maps designed by Aqueduct analyst, Francis Gassert, reveals where crops are grown in areas of high competition for limited water supplies and shows that 56% of irrigated agriculture face high water stress. The tool allows users to zoom to areas of irrigated and non-irrigated farm land around the world and visualize where the demand for water is greatest. With water demand forecasted to increase 50% by 2030 due mostly to agriculture, the tool helps show the urgency of finding sustainable means for food production. Coverage of the Aqueduct Commodities Interactive Map appeared in Energy & Environment (subscription) and Salon, among others.